Possible to do oil sprocket without removing engine? As title says, sounds like my oil sprocket is done. When I start the car, it squeals like a pig. I've left this repair for over a year, as I was hoping to find a local shop to do the repair. Nobody is interest in touching my 06 Fortwo. I guess I will have to try it myself, is this possible leaving the engine in and removing the tire and hub, or does the engine have to be removed? Can be done with engine in provided you are sufficiently Smart. Squeal at start is unrelated to oil pump sprocket and is normally slack belt and / or worn alternator pulley. Mine squeals after start, and for a while driving it. It's pretty high pitched. It is a ''pretty big job''!!!! That's for sure! It was almost 7 years ago that an oil chain sprocket and chain was replaced in my shop. I fact I totally blocked it out of my mind and swore I would never do that again! And it was done without dropping the engine. At the time I was working full time and the majority of the work was done by my assistant. The good news is that I was told the smart was still running fine last summer when it was sold by member Inno. One can replace oil pump sprocket in only 3 to 4 hours provided one is sufficiently Smart and not clumsy. must come off too so perfect time to either replace sump or clean up and paint. I'd say it's the alt also, but again if it keeps squealing after freeing it up and soaking it in WD40 then I'd admit maybe it's what you are hoping it's not. Also get yourself some belt dressing and spray the belt to get it a bit sticky so it won't slip as easily. Just make sure it doesn't get into the ALT. But I'd be trying to fix the alt first even if it meant taking that off and cleaning it out or getting it rebuilt just for shits and giggles. I took the beater's alt out and what a job also....not a job for larger handed folks...lol. But it was caked in crud and surface rusting internally...which all came off and cleaned up well. I also trimmed a hair off the internals to give a few millimeters of extra clearance as Tolsen did....all in the hope that anything was better than simply settling for a freshening up only. But to do so you require a lathe and most folks don't have use of one. But even simply a good cleaning inside can't be anything but good for the squealing issue....imho. Some fresh lube and sealant to help reduce rusting issues and fingers crossed. Doing this has to be easier than what people are suggesting the work is to change the oil pump chain and sprocket.....but if the alt doesn't fix the issue, then you have to do the nasty job also. Might be a moot point. Lol. It fired up after I unseived the alternator. I gave it some gas to around 2500 rpm after it ran for 10 or 15 minutes, it was fine with the higher rpm, but when i let my foot off the gas it stalled. Now it won't start again. Real rough while trying to start too. Here is a link to YouTube for a video of the sound. I couldn't figure out any other way to post the video, I hope it's not breaking any rules.. Sounds like metal on metal to me in person. I can try the alternator, I have one in the backup car I can try and get off and clean first, that way I can figure out the best swear words when I go to take this one off. I will suggest you were correct with the oil sprocket and chain. That sound if I'm hearing it right sounds like a chain traveling over a sprocket, both worn and flopping around...? OR, possibly a shield somewhere that has come loose and is rattling around a bit...? But, I'm putting my money on the sprocket and chain......not the alt....sorry. Yeah, that's what I figured. Guess I'll give it a shot, as I can't find a single mechanic that wants anything to do with this car. I'll crack a few beers this weekend and try to channel my inner smart, while expelling my external clumsy. I was browsing the other threads, I'm overwhelmed just from the pictures. Any chance anyone has the part numbers from mb for the not crap sprocket and chain? Or an externally sourced one? Is this the one? Seems to have a lot of things I won't need. Other problem, it's from Taiwan...is this a quality level I should avoid? I have a bore scope, or a camera on a flexible stick, it takes serious patience as noted above to get it where you want it to be. Other than that it's a great tool for just this issue. 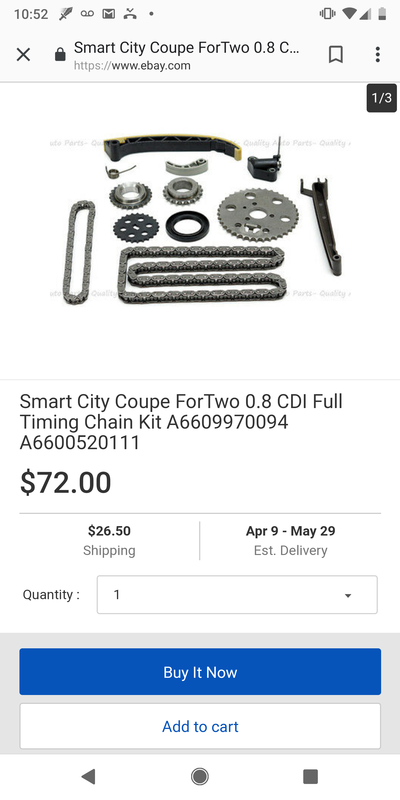 I have also used several of these cheap aftermarket timing chain kits. All Smart cars where I fitted them still run and no complaints so far so I guess better than original. Ok. I'll order this one, and wait for it to arrive. I would try and take the parts out of my part car, but it seems this is a pretty high failure rate part. IF you are thinking of keeping your smart for any length of time, I'd pull engine and go over it. From the spare car that is.....why not rebuild it and then simply do a swap and end up with new rebuilt engine in your driver.? Yes more expense but a far better end result that is IF you wanted to keep the smart long term.